Are you going camping? Heading to a park for a picnic afternoon? Then it’s likely one of the places you visit will have horseshoe pit. A normal amenity for a park, so here’s the rules for how to play. Horseshoes is a wonderful 2 or 4 person game, and like our family does can even make a great tournament competition. If you don’t have access to a traditional horseshoe pit, rubber portable horseshoes are an alternative and fun option. If this isn’t an option and there are games like horseshoes that offer more portability. We put together this easy to read infographic for how to play horseshoe, but keep reading for further specifics below. The goal of the game is to score 21 points for the win, in competition games, this score is 50 points. When we play in tournaments we will play mini series of 11 points. Horseshoes is a game that can be played with 2 or 4 people. You can find the full rules for competition horseshoes on the National Horseshoe Pitchers association. In these instructions we will cover the simple rules that we play in our backyard and camping. To play Horseshoes, you will either be playing with existing pits or setting up your own pit. Setting up your own pit involves hammering a stake into the ground. Horseshoes is best played with a sand pit so that the bounces of the horseshoe can be absorbed and rebounds controlled within the pit. For safety, this is the best recommendation. You are throwing huge metal horseshoes after all. To setup stakes, place the stakes 40 feet apart from each other. In the official horseshoes rules, the mens throwing line is drawn at the end of the horseshoe pit. This line is approx 37 feet away from the stake. The women’s line or line for those under 18 years old, is allowed to be 27 feet away from the stake. The throwing lines cannot be passed either by your hand or your foot. When throwing, stand on the pitchers platform, the 15″ platform that is on either side of the pit. For regulation games, the pitchers platform should extend from the pit to the 27 foot spot to accommodate for the womens line. If building a horseshoe pit, the pit should be approximately 45 x 32 inches. Build a back board and side boards around the pit in a u-shape, to catch the horseshoe rebounds. Fill the pit with loose soil, but sand is recommended. On each side of the pit, is 2 boards measuring approx 15″ and called the pitchers platform. Each round consists of 2 opponents, standing beside the same horseshoe pit taking aim at the opposite pit. The total of 4 throws per round. Each player throws both of their horseshoes aiming for the stake, hopefully for a ringer! Once both players have thrown each of their 2 shoes, this completes a round. Keep reading below for how to score each round. If you are playing with 4 people, after the round, then it now becomes the round for the 2 players at the opposite end of the field. The team that won scored the most points in the round is the winning team going into the next round is the player that gets to play first. There are a couple techniques to throw the horseshoes. The first is how to hold the horseshoe. Hold the horseshoe in the middle of the bottom of the horseshoe. Or hold it between you thumb and index fingers along one side of the horseshoe. When throwing, we like the technique of taking a step at the same time that you throw to get more momentum behind your throw. Before we cover the details of how to score, know that horseshoes scoring works on a “cancellation” basis. This means that if each person both gets a ringer, then those points each cancel each other out and no person gets points for the round. – Ringer = 3 points. Wrap the horseshoe around the stake for a ringer. In order to be qualified as a ringer, the horseshoe must fully wrap around the stake. You can measure this, by can you draw a line from the each end of the horseshoe without it touching the stake. This will measure that the horseshoe is “around” the stake. – Closest horseshoe = 1 point. If there are no ringers in the pit, then the point is awarded to the horseshoe that is closest to the stake. – Double points = 2 points. If both of your horseshoes are closest to the stake, and if the 2nd horseshoe is within 6 inches of the stake, will get 2 points. If you have a ringer, and your second horseshoe is within that 6 inches, you get 3 points for the ringer and 1 point for the closest ring. However, your opponent is the 2nd closest, you only receive the original points. 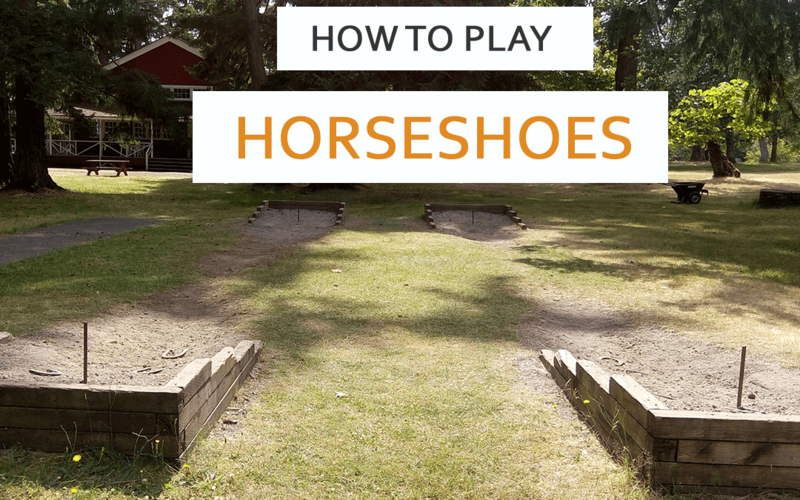 Horseshoes is a relatively simple game to learn and explain. But don’t let this fool you, there will be times that you find yourself and all players standing over a pit, arguing who is the closest. There’s no shame in getting out that measuring stick to see which horseshoe is closest.